The Markets ended the expiry day of the April derivative series on a positive note as the NIFTY ended gaining 47.25 points or 0.45%. The session remained absolutely quiet, contrary to expectations. Expiry led volatility was expected but the Markets spent the entire session in a 20-point sideways trajectory. It was only the last 30-minute of the trade that saw the spurt, majorly driven by short covering. We expect the up move to spill over to Friday as well. With a caveat that we do not have any overnight weakness in the global markets to deal with, we are likely to see a modestly positive opening, though the 10650-mark will continue to pose immediate resistance to the Markets. Friday is likely to see the levels of 10650 and 10735 acting as immediate resistance levels. Supports come in at 10575 and 10540 zones. The Relative Strength Index – RSI stands at 63.8754. 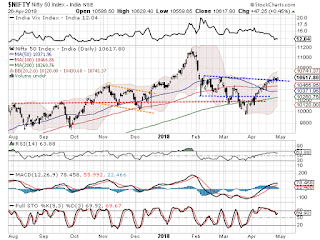 A bearish divergence is observed as while NIFTY has marked a fresh 14-period high, RSI did not. Daily MACD continues to remain bullish while trading above its signal line. Pattern analysis of the Daily Charts shows the Markets accumulating in a narrow sideways trajectory after testing its important pattern area resistance. 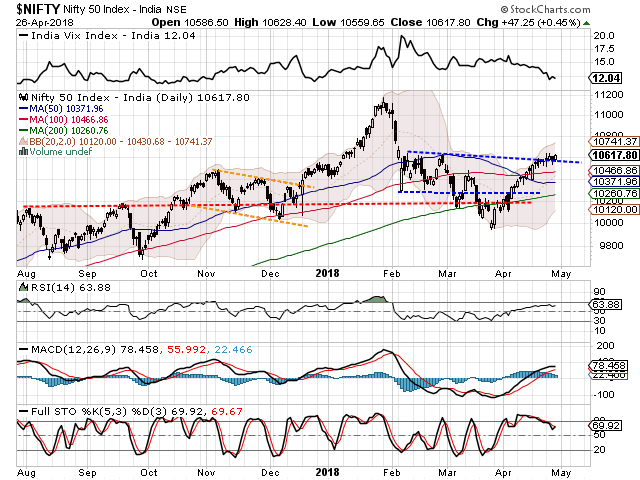 After more than 500-point up move from the immediate lows, the NIFTY is just remaining sideways after testing resistance and is showing no signs of any retracement. A sideways movement after a strong pullback often translates into a base formation for further up move. Also, the new series is likely to start on much lighter note as well. Contrary to the short positions that were being piled up in the current month, long rollovers were witnessed in the next month. However, we still have to exercise some caution until the levels of 10650 is taken out with conviction. We reiterate to continue to utilize dips into making fresh select purchases. A cautiously positive outlook is advised for the day. Good technical set up is observed in stocks like ONGC, CGPOWER, HINDZINC, GREENPLY, JAIBHARAT MARUTI, ESCORTS, TD POWER SYSTEMS, NTPC, IIFL HOLDINGS and .